The 41-year-old librarian from Petrosani, Transylvania started his stage swim from Donaueschingen in the Black Forest in Germany. He is now heading into Day 42 as each day is a dynamically different replication of the day before. Today has been the first full day on the other side of the dams, as Iancu calls it. “It was the first day knowing that the next dam will be 800 km down the line. This gave me the most incredible feeling - I got in the water full of enthusiasm despite the strong wind that stayed with us the whole day.” He paced himself swimming 4 stretches of 10 km each. For the first 30 km he felt excellent, but during the last 10 km he started to feel tired making this last stretch more challenging. Having reached the 1770 km milestone, the team camped for the night, had a big dinner and are now looking forward to tomorrow. They only have 60 km left in Slovakia, after which the Danube continues into Hungary. Iancu swam 31 km today in a steady rain that did not stop all day. Taking breaks and getting out of the water did not bring much pleasure either, with no shelter from the torrential rain. The cold almost pushed Iancu into hypothermia, and as he tried to get dressed, his clothes got wet, as he remained cold and uncomfortable. 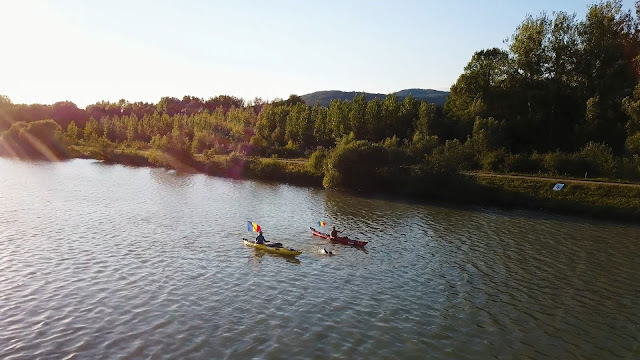 Today Iancu left Slovakia and reached Hungary - the Danube's fourth country, swimming a total of 40 km. Just after crossing the border, Iancu was met by the Romanian Consul to Hungary who welcomed him to this part of the journey. The team have now reached Visegrád and passed the 1700 km milestone. After leaving Visegrád early in the morning, Iancu and his team decided on which waterway of the Danube to go - the main one, with rapid currents but also a lot of traffic, or Szentendre - smaller, without boat traffic and currents. Based on a friend's recommendation, they decided for Szentendre. "It was a very smart decision, the Danube was very quiet and I managed to swim another 40 km today. I am now at the entrance to Budapest, 9 km away from the Parliament building." Today Iancu and his team reached Budapest, the third capital city along the shores of the Danube. After swimming 8 km and one and a half hours, Iancu reached Fanny, the vessel on which his welcome to Budapest was arranged. Here he was welcomed by many fans and media. "This welcoming exceeded all my expectations." He received an official recognition of his efforts from the local officials who offered him a certificate recognising and saluting the 1210 km he had already swum on the Danube. However, before reaching Fanny, Iancu and his team were intercepted and questioned by the police - the first police team to stop them so far on their journey. After informing the police about the expedition, Iancu and the team were escorted to the boat where their documents were checked. As they already had the approvals needed to embark on such a journey, everything turned out well, even though the swim was interrupted until after 3:30 pm. Once he was able to swim again, Iancu passed Budapest, swimming 19 km in total today. "The water was very rough - the roughest I have ever seen. The waves were huge and irregular, due to the huge traffic on the river. If I wasn't paying enough attention I could have been badly injured. I also swallowed a lot of water and was close to drowning a couple of times. We were however helped by the police boat who accompanied us through this section because of the high traffic." Today Iancu and his team had a lovely day - with sunny weather and no clouds. This enabled him to swim a total of 42 km today. The team was also cheered on by another group of Romanians 20 km into today's journey. Now they have camped by the 1598 km milestone and are excited to start again tomorrow.